With each passing day we slip further into darkness. It is the reality of this season and some might argue a reality of our world. Last night as I lit a candle for dinner I was reminded of the power of one single flame to light a dark room. And yesterday I was reminded of the power of one single person to create light in the darkness of the world. Malala was barely eleven years old when she became a champion for girls’ education in her Pakistan homeland. She was only fifteen when she was shot in the head for her advocacy and for speaking out. Now seventeen, Malala Yousafzai is the youngest ever winner of the Nobel Peace Prize. When I heard this news on NPR I was disappointed to hear one of the people interviewed comment that this award was all the more remarkable because Malala didn’t even have a Ph.D.. As Malala would assert, education is important. 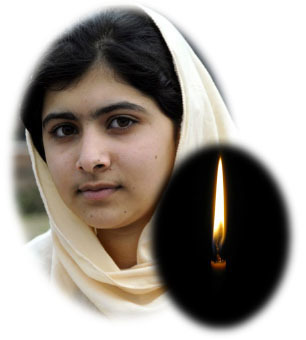 But as her example demonstrates, the only thing we need to know is that it only takes one flame to light the darkness.